Ten days ago our beloved Central Abbot, Myogen Steve Stücky, received a medical diagnosis of stage-four pancreatic cancer. He shared this news with his family and a few Zen Center leaders, and then wrote an inspiring letter, which was sent out to a few more of his close friends and colleagues. A copy of that letter is below. We are stunned by this news, and challenged to find ways to accept it. Needless to say, we are offering our complete support to Myogen and his wife Lane and his entire family. The exact steps that will be taken to meet the cancer are still being determined, and this site will include updates on his condition and allow you to leave messages. Myogen continues to be engaged in key decisions that are part of his role as Central Abbot, while also expressing his commitment to studying deeply the needs of his body. He gave the Dharma talk last Wednesday at Green Gulch Farm, and is scheduled to give the talk this evening at the City Center. A group of us—including Abiding Abbess Eijun Linda Cutts, City Center Abiding Abbot-Elect Rinso Ed Sattizahn, Zen Center Board Chair Mary Morgan and Zen Center President Zesho Susan O'Connell—are meeting weekly and are prepared and fully committed to support Myogen, and Zen Center. We will be absorbing some of the duties Myogen has so beautifully cared for, as the need arises. We extend our thoughts of compassion to Abbot Steve and hold him and his family in our hearts. Today, after two weeks of increasing pains and weakness, Lane and I reviewed the results of last Friday's CT-scan with Dr. Zhang, oncologist at Kaiser, Santa Rosa. The symptoms and visual evidence are consistent with pancreatic cancer stage four. There are lesions in the lungs, liver, spleen, and a mass on the lower end of the pancreas. Biopsy results will be forthcoming with more precise detail, hopefully by the end of the week with chemo-therapy beginning next week. Dr. Zhang believes that if left untreated, I could expect to live three to six months. Effective chemo-therapy should improve quality of life and perhaps double life-expectancy. My extended family has already been informed of the situation and I look forward to your support as I rearrange my planned activities to take the best care of this body and all the relationships that are so important and rewarding . . . especially those with each of you. Please address any questions to my assistant, Mary Stares, and we'll do our best to respond. Perhaps we'll set up a a site for regular updates. to what shall I liken this life? This new dedicated blog begins to follow Steve's condition and progress as he works with illness and its implications for his relationships with students, colleagues, friends and supporters. The Subtle Eye site, named for the translation of Myogen, welcomes your comments during the process. In addition, a Facebook page set up by one of Steve's students, Renshin Bunce, has been collecting comments and photos from many students and friends. The Dharma event this evening at 7:30 pm at City Center will be focused on Abbot Steve. The latest report is that although he very much wished to be present to give the Dharma talk, he will not be able to due to his condition today. Instead, the community is invited to listen to a playback of his recorded Dharma talk at Green Gulch Farm last Wednesday, with the opportunity for comments and sharing afterward. All are welcome. His talk last week at Green Gulch Farm is now available on the main SFZC website. Posted in Uncategorized on October 9, 2013 by Jay Pennington. I'm so sorry to hear the news of your pancreatic cancer; you are such a blessed being and have done so much for so many. I only feel fortunate that our paths crossed and I got to know you, albeit briefly. I have benefited greatly by your presence and energy. I am sending you love and gratitude and wishes for peace on your journey. I received this news last week - now it is part of what I carry each day. 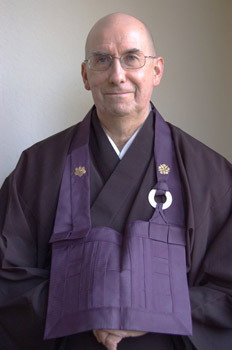 Steve is among the great beings that Zen Center has been so fortunate to attract over the years; his Mennonite upbringing no doubt contributing to his "native" feeling for Zen practice and life. I count myself lucky to have spent 2 years in the mid-80's working with Steve in his landscape construction business. I've already sent personal wishes, so here I just acknowledge with the Zen Center community our shared sadness and sense of impending loss. And to Steve's family, Lane, James, Hannah, and Robin - my heartfelt wishes of love and compassion. I've never met someone with such a warm and welcoming presence as yours. The few times I encountered you during my short stay at Tassajara and City Center affected me like nothing else. You've lived in my heart and mind since, and always will. I have heard you speak and teach the Dharma a number of times at SFZC and I have great appreciation and respect for your sharing Dharma wisdom -- it has benefited me greatly. Thank you. I am writing because I have not had the opportunity to sit zazen with you and was wondering if there is any times that you plan to sit with the Sangha in the SFZC zendo. I would only show up at the zendo, bow and sit zazen with you and the others -- that is all. This, I believe, would be beneficial to me and others. Of course, I understand you have a busy schedule and may not be sitting at the SFZC. But, please let me know if/when you plan to sit at SFZC. Thank you. I am new to the path, and last night, I opened the Zen Center podcast entitled "Gratitude". I admit that when I learned of your situation, I almost turned off the podcast, thinking that it was too heavy for me. I decided to listen and I am very glad that I did. My worst fear is cancer and the possibility of facing death, but your words and attitude were and are still ringing powerfully with me. I am still not exactly sure what I could possibly say to you other than to show you my gratitude. Thank you very very much, Steve. My thoughts are and will continue to stay with you. Heart is breaking open. Deep bows to you, your family and the sangha. Patricia informed me of your condition since her co-worker is a member at DEZC. We were both sad and shocked. We are both very grateful to having begun our relationship sitting zazen with you and the sangha at your home in SR ten years ago. You are a true Buddha. I'm so sorry to hear this news. My thoughts and prayers are with you and your family. This morning I have been stunned reading about your illness. All my love in the Dharma is with you and your family. Take care of yourself. Greetings Steve. You are all in our thoughts. You're probably being bombarded with lots of 'advice' that you already know, but here's mine. I hope you are considering the use of cannabis in some form as an adjunct to your other treatments. Even the Feds can no longer deny it's potential. In my opinion this is an extremely conservative evaluation, but it's a step in the right direction. The bibliographies alone are a great resource to guide further investigation. Be well. Enjoy every moment. Patrick Monk. RN Hospice Case Manager. SF. Ca. Dear Steve; I´m a zen student from Argentine, and i liked so much your "image" as I read the Fire Monks... As a a physician I know that you have a tough disease to live with. I know you will be fine... And I will be thinking of you and your family, my heart is with you. I am so sad to hear of your illness. Peace be with you and your family. "A drop of dew is a drop of dew, and yet, and yet......"
May our hearts and prayers continue to meet through the depth of our realized interconnection and may the merit of this deep awareness benefit Steve and all who love him. We have never met, but I'm in your larger sangha, being a member of Berkeley Zen Center. Thank you for your Green Gulch dharma talk. Your teaching is helpful to me and to others to whom I have sent the link. I don't know what to say except that my thoughts are with you and your family and all of us--will be thinking of you as you start chemotherapy on Friday. I want to add something to consider. It's not offered as some sort of magic potion--just something that may support your immune system in the coming time. There is reason to believe that Vitamin D may be supportive and may lessen the impact of various cancers. Many of us are deficient and can benefit from active (even aggressive, initially) supplementation; of course, like anything, it can be overdone. But for most of us, the problem is a deficit. I hope that in all the blood work that will be done a simple Vitamin D 25(OH) test will be checked and if you are low you will take supplemental amounts to raise your level into the normal range of ~50-75 nmol/L (20-30 ng/mL). Btw, I am a physician (internal medicine and geriatrics). Sincere and heartfelt thanks for your excellent teaching. File under "Don't believe Everything you think." I'm with Patrick Monk regarding Medical Cannabis. I have a friend in New Mexico who is a grower. He suggested Phoenix Tears Oil. Hard to find, but you've many alternative friends who love you very much. Wink. Wink. Its all over the Internet if you are up for research. A secret admirer who used to live down the hall. Dearest Steve & all in the San Francisco sangha - I am part of your wider 'invisible' sangha, a member of the Sydney Zen Centre now living in Brisbane, Australia. For many years, in various cities, your compassionate & insightful words have helped guide & strengthen my practice. 'There's Young Buddha' is a favourite song of my 6 & 4 year olds & just yesterday we gave Red Robin our best! How your breath enlarges all of space. Grows mighty from the nourishment thus offered. Move through transformation, out and in. The sense of their mysterious encounter. Whisper to the silent earth: I'm flowing. All at once my heart feels sadness but is best at the same time. You never left my side. You smelled the roses with me and helped me to find the beauty of the roses in the darkest part of my life when I was lost and afraid not knowing who I was, you helped me to learn to stand on my own two feet. You put up with me and walked down the ruffest of roads with me, never leaving my side. You cried with me, gave me a firm hand when I needed it and never put up with my you know what behavior. I see the beauty of the moment in the here and now without getting wrapped up in created stories. As a result I see all the beauty that gave to my heart that blossumed the rose within me opening my heart so I was able to come home. Because of this your voice and words of wisdom echo the walls of my heart and will forever bless each new begining of everyday right here right now. As you said when I first met you ' EVERYDAY IS BEAUTIFUL DAY MICHELE' Well it is for all of us who are so blest in our hearts by you. I love you Abbot for all that you are and GRADITUDE for for your unconditional love and devotion to the sharing of you teachings in my life. Thank you Steve and Lane and Mary for sharing this journey with everyone that loves and cares about you. Steve, your clarity, courage, humor, honesty, and understated wisdom struck me the first time I met you, before I knew a thing about your path to the present moment. Now you are in my thoughts every day. Know how many people are with you with love.